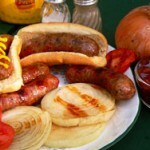 Follow our step-by-step, photo illustrated recipe for Grilled Vidalia Steaks with Sweet Italian Sausage. 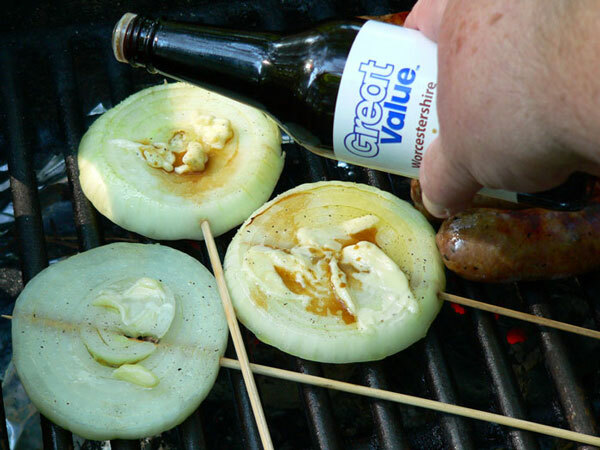 We’re headed to the park to grill up some delicious Vidalia onions along with Sweet Italian Sausages. Serve these thick sliced onions on a plate or, grab a bun and make up a sausage dog with onions that will have all the family begging for more. Note: This is the second in a series of step-by-step recipes that we created for the Our State Magazine website and their Our State Eats blog. Summer is a great time to pack up the family and head to the nearest park for a day of fun, games and just enjoying time with each other. Today, I’m heading down to one of my favorite places, Harris Lake County Park, for some serious fishing on The Pier and some delicious Grilled Vidalia Steaks with Sweet Italian Sausage. You could easily prep the onions at home first then, all you have to do is heat up the grill and start cooking once you arrive. 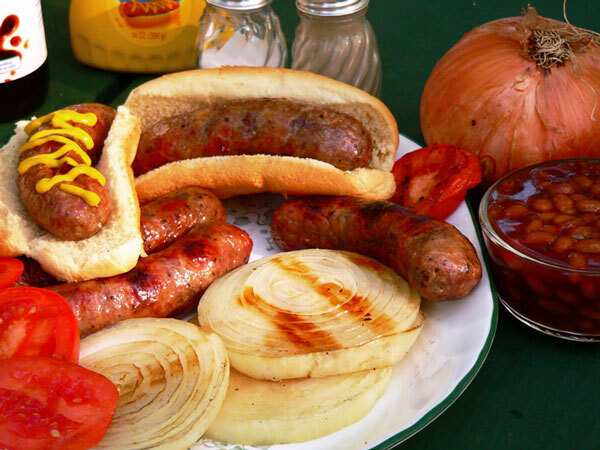 The kids will love the Sweet Italian Sausages placed in a hot dog bun to make sausage dogs and, the adults will love the sweet taste of the Vidalia Onions after they have been roasted on the grill. Its a win win for everyone involved and, so simple to do. 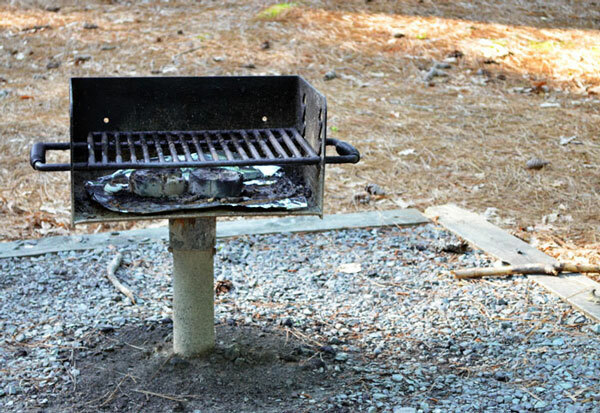 Be sure to protect our parks and make sure you keep a close eye on the grill once it gets going. I always carry a jug of water just in case things might get out of hand. Better safe than sorry on that one. And, be sure to clean up really good once you’re finished so the next person that comes along can have a great time with their family as well. We have to hand it to those folks down in Georgia for growing some mighty fine onions. I always look forward to the new crop coming in each year and even if you can’t find them, a good white onion will work just about as well. So, if you’re ready, Let’s Get Cooking… make that Grilling! Most parks will have a few grills available for cooking on. Just remember to be cautious while using it. This one at Harris Lake County Park is placed in a square filled with gravel but that pine straw isn’t so far away that a spark couldn’t get something bad going in just a minute or two. Always keep a jug or two of water handy to prevent any problems. 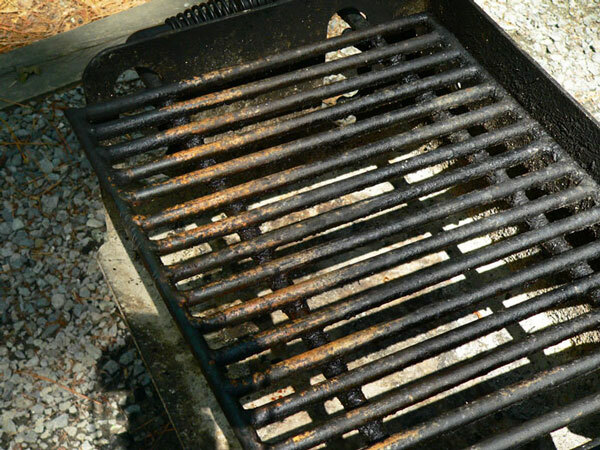 You’ll want to clean the grill a bit before you add the charcoal and get a fire going. 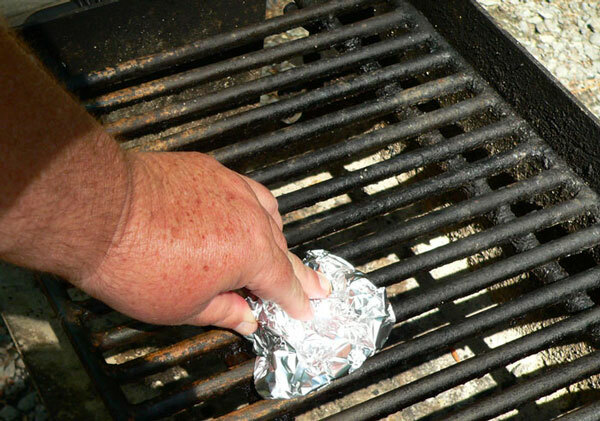 Use a piece of crumpled up Aluminum Foil and give the grate a good scrubbing. I use the same thing to clean old cast iron skillets when they have a buildup on them. 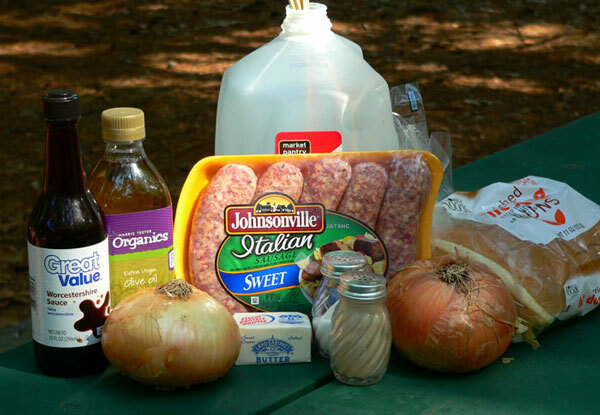 Grilled Vidalia Steaks with Sweet Italian Sausage Recipe: You’ll need these ingredients. Follow the instructions on your bag of charcoal to get the coals started. Once they have ashed over, place the sausage links on the grill. 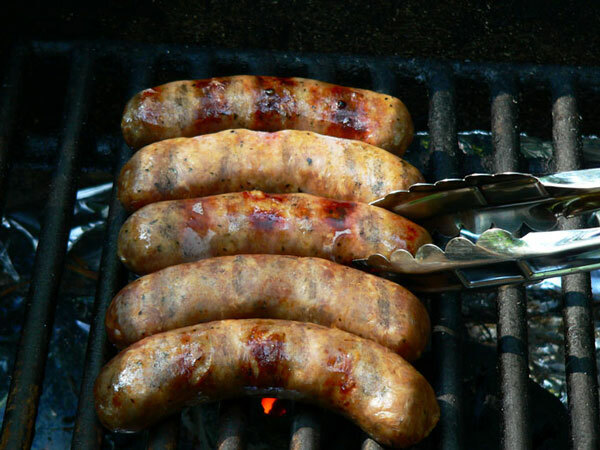 I’m using Johnsonville Sweet Italian Sausages for this recipe. Since these are not pre-cooked, they will need to fully cook. This will take about 20-30 minutes on average until they reach an internal temperature of 160ºF. You’ll need to turn them a time or two as they cook in order to get them cooked evenly and without burning them on the outside. Once they start cooking, go ahead and prep the onions. Begin making the Vidalia Steaks by peeling and slicing the onions. 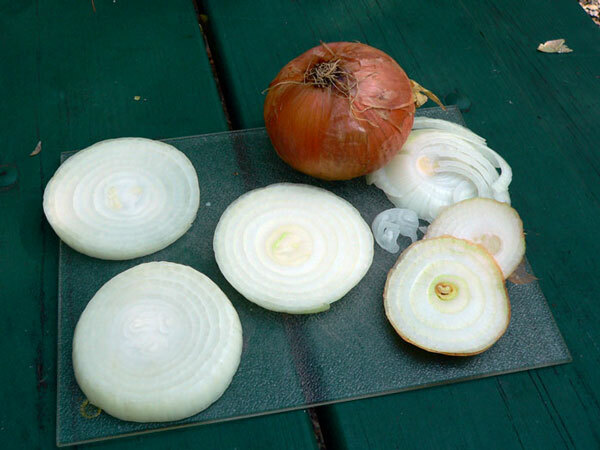 Remove the thin outside layer of the onion and discard it. 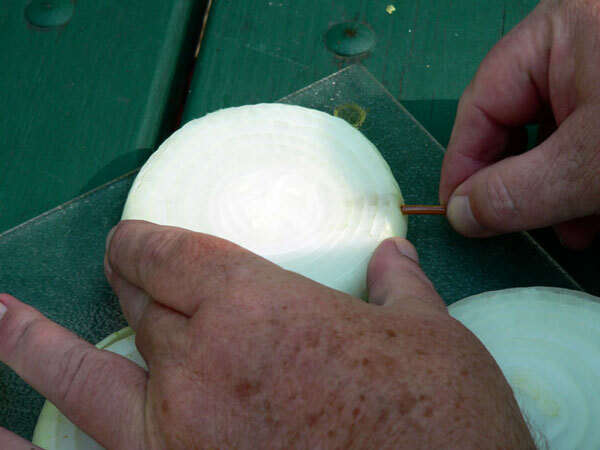 Use a sharp knife and carefully slice the onion into slices about 1/2 to 3/4 of an inch thick. 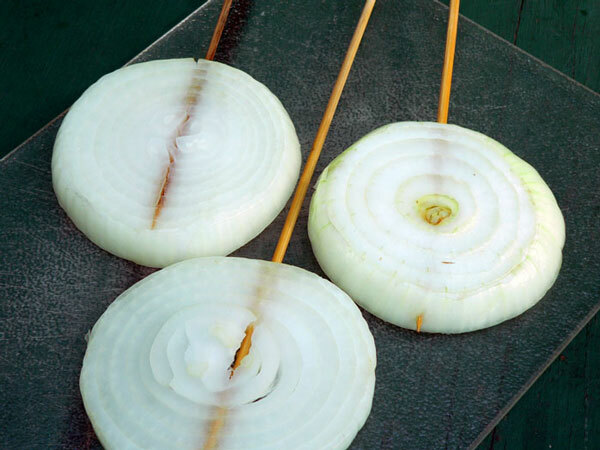 Wooden skewers need to be soaked in water for about 30 minutes prior to inserting them into the onions. I soaked mine in the jug of water I had brought to keep on hand around the hot grill. 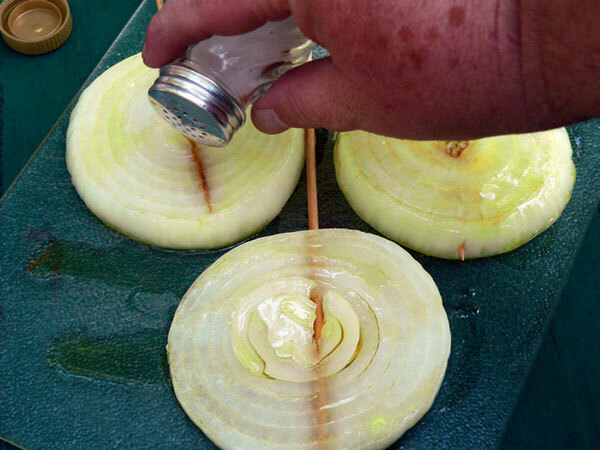 Carefully slide the skewer into the onion slice and push it all the way through. 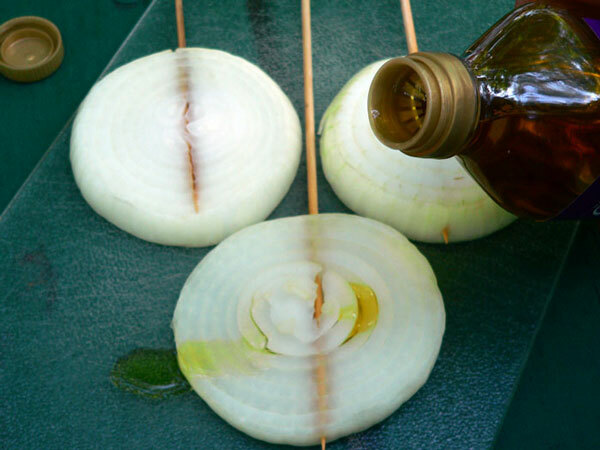 Run skewers through all the slices of onion that you’ll be grilling. You could trim off the excess if you have some snips of some type handy or, just leave them and have onions-on-a-stick. Drizzle a little Olive Oil onto each slice. Use a brush or, your fingers and, spread the oil evenly across the surface of the onion. Flip the slice over and repeat on the other side. Sprinkle on a little salt to taste. Sprinkle on a little Black Pepper. Be sure to keep an eye on the sausages and turn them as needed. Once the sausages have cooked about halfway, lay the Vidalia Steaks on the grill. Add a little butter to each steak slice. Chances are your butter will be fairly soft after being out of refrigeration for awhile. Just smear a big dab on each slice. Sprinkle a little Worcestershire Sauce on each slice. Let the Vidalia Steaks cook until they are tender and slightly translucent. Use the skewer to gently lift them and make sure they aren’t burning on the bottom. Flip them over about halfway through and let them cook until done. 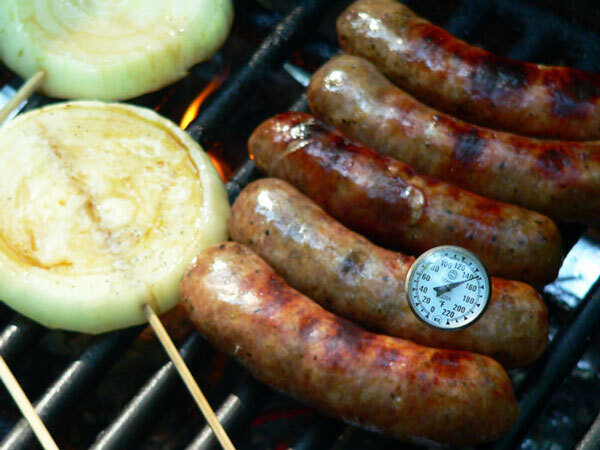 Use a thermometer to be sure the sausage links are cooked to 160ºF. These little pocket thermometers are used by chefs every where and only cost a couple of dollars to purchase. Serve the Vidalia Steaks on a plate alongside the cooked Sausages or, place a sausage link in a bun and, top it with some mustard and some of the sliced up Vidalia Steaks for a great sausage dog treat everyone will love. Enjoy! Place charcoal in grill and light according to package directions. 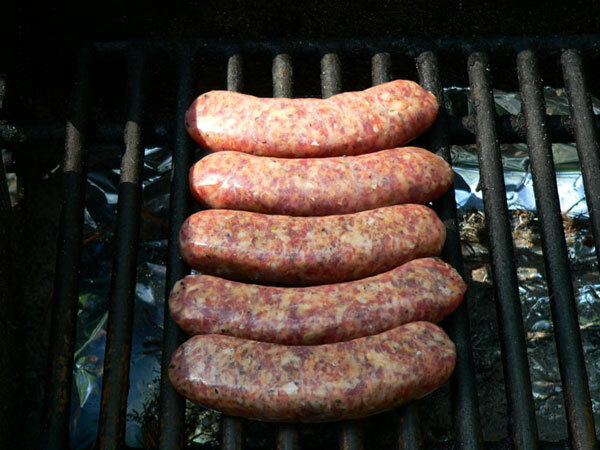 Place sausages on grill and cook until 160º internal temperature, turning as needed. Peel onions, slice into large slices about ½ inch thick. 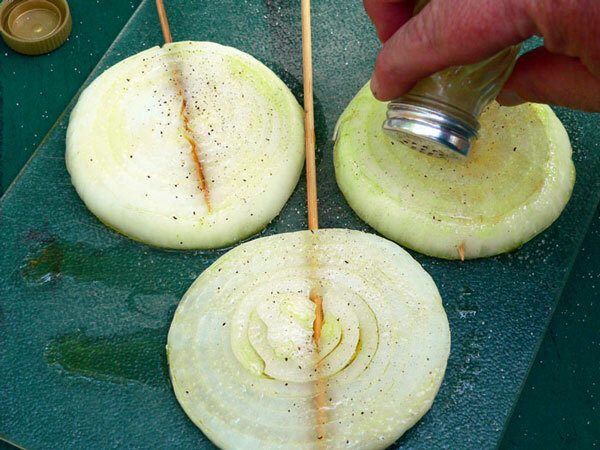 Carefully slide skewers into onion slices. Coat both sides of each slice with Olive Oil. 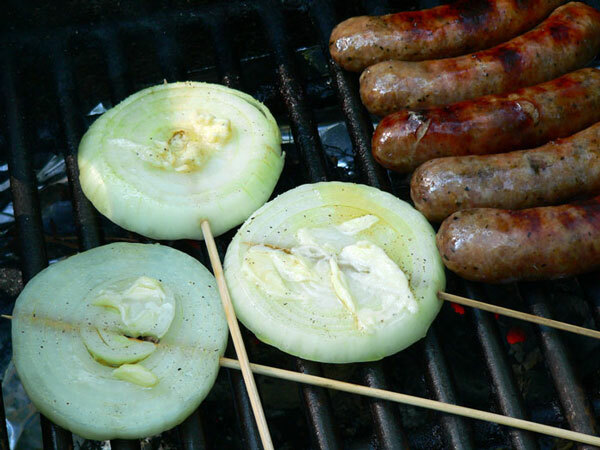 Place onion slices on grill. Add butter to each slice. 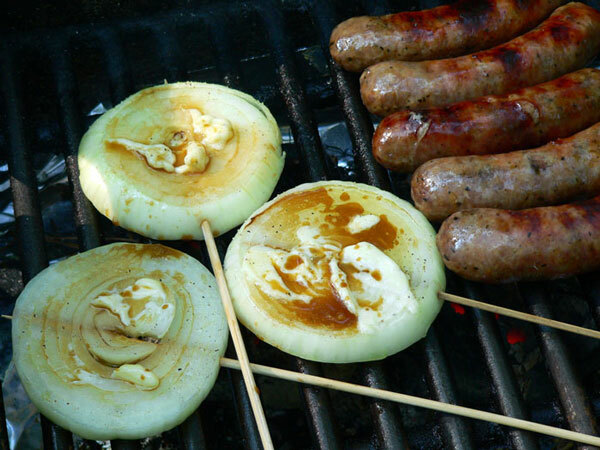 Grill onions until slightly transparent and tender. Serve warm, with sausages and enjoy. Your Comments: Do you like to grill foods? Whats your favorite? As with all of our recipes, I greatly appreciate your feedback and comments. It only takes a minute or two to share your experiences if you try one of our recipes and it might help someone else that is considering testing one out. Remember though, all comments are moderated before being approved for our family friendly site. That means that I personally read each and everyone and I will reply to your comments as much as time permits. So, take a minute while you’re here and share your thoughts with us in the Comment Section below. And, while you’re here, be sure to sign-up for our Newsletter in the box below or the one at the top right hand corner of every page. I try to send out a weekly Newsletter to let you know we’ve posted another recipe or of anything else that might be going on around Taste of Southern. I’ll look forward to you returning for another visit… real soon. Hi Deb, Thank you for the link on your blog and glad to hear those STEAKS turned out well for you. It always reminds me of the State Fair when I start smelling them cooking and our North Carolina State Fair is right around the corner. Thank you for stopping by and visiting with us today. I hope you’ll visit with us often.